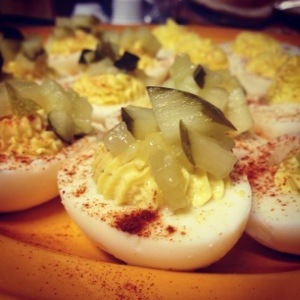 It is not a summer party unless there are deviled eggs present. Apparently it is August and some people seem to be worried that the summer is over but the summer lasts till October here in Eastern North Carolina. And we are super lucky because the weather almost any month of the year is suitable for outdoor barbecues. This is a super simple but wonderful recipe, spiced up with sriracha. 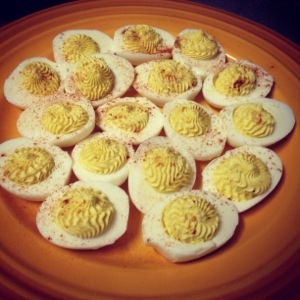 There is nothing I detest more than over-cooked boiled eggs. The method below is foolproof. I make 7 eggs with the assumption that one egg white will not look good enough to go on the platter. The recipe is easily doubled. I diced some clausen pickles for half the eggs. If you are taking these to a summer barbecue or to your tailgate in the fall, leave the light beer behind and take a sparkling rosé instead. Arthur Metz Crémant d’Alsace Rosé is a sparkling from France that will delight any barbecue. It is made from 100% Pinot Noir, smells like rose petals, and tastes like fresh summer berries. Crémant d’Alsace is the specific designation by the french government for wines from this particular appellation. You should serve Crémant d’Alsace as you would champagne, in a flute, chilled. These Govino Champagne Flutes are perfect to take to parties, the beach, or to a tailgate. Place eggs in a single layer in a saucepan and cover with water, 1 inch of water over the eggs. Over high heat, bring to a boil. Cover the eggs, turn heat to low, cook for one minute. Remove from heat and leave covered for 14 minutes. Rinse under cold water for one minute to stop the cooking. Place the yolk mixture in a pastry bag fitted with a half inch wide tip. Pipe evenly into the egg white halves. Garnish with paprika and relish as you desire. The best brussels sprouts I have ever eaten were served at Westville, a restaurant in the upper west side of Manhattan. This place makes the most delicious vegetables I have ever tasted. Not to mention the most amazing grilled cheese sandwich. Soon I will create these things in the Bubbly Kitchen. 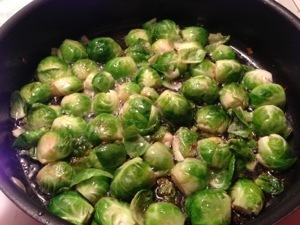 Until then, you have the brussels to end all brussels. 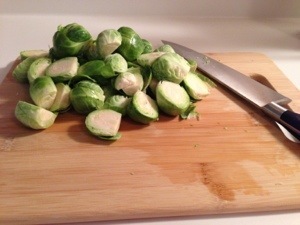 These sprouts will make people who claim to hate brussels sprouts love them. I made them for dinner last night and I am not sure how many pieces of bacon I used but it was too much (I know, right, you can never have too much bacon!!). So I saved the extra bacon bits for salads. But if you want them heavier on the bacon, by all means use more. I think shallots would also be great in here. But I am a huge fan of vidalia onions and always have them on hand. This is a very versatile vegetable dish. I have served these with Thanksgiving dinner and with fried eggs and toast for brunch. One key is to make sure you cut them all in half and remove any loose dark leaves, these make the sprouts bitter. They are especially fabulous when served with Chateau Ste Michelle Indian Wells Chardonnay 2011. And obviously your choice of sparkling accompanies these brussels for brunch. 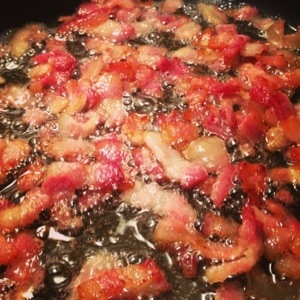 Cook bacon in a medium sized skillet over medium heat until browned and crispy. Remove with slotted spoon and set aside. Sauté onions in the bacon fat left in the pan over medium heat until soft and slightly brown, approximately 8 minutes. Add garlic into the pan, cook for 1 minute until aromatic. Remove onions and garlic with slotted spoon. 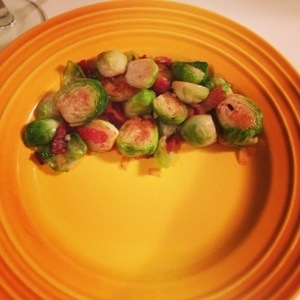 Place brussel sprouts in the pan with leftover bacon fat. Cook over medium heat, stirring a few times, for 8 minutes, or until charred in some areas and crisp-tender. Remove from pain with slotted spoon. Toss with onions, garlic, and bacon. Season to taste with pepper. This is an original recipe from Bubbly Kitchen. 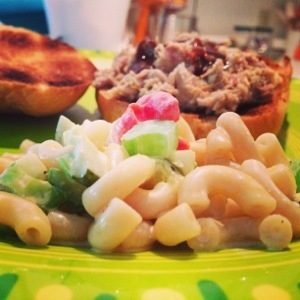 I only made this macaroni salad to use up leftover macaroni for a fun experiment. But I’m not sorry about it. Oh having a party, someone invited 5 extra people, just make this in 30 minutes in case there isn’t enough food. And then forget to serve it and eat it all. The magic here is really in the pickles. I don’t think this would be what it is without pickles. It could also be the Dukes mayonnaise. I once listened to a woman talk for an hour about Dukes mayonnaise. I feel obligated to use it now. Prepare the macaroni as directed and rinse with cold water. Whisk together the mayo, mustard, lemon juice, and sugar. 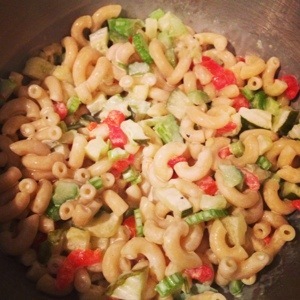 Add in the macaroni, celery, pickles, and pimentos.